One of the big buzzes around Macon lately is the new ownership at the Rookery. Wes Griffith and Chad Evans partnered into one of downtown's must loyal establishments, and instead of rocking the boat, they floated a few ideas and made the boat better. One of the biggest changes you'll see (and smell) at the Rookery is it's non-smoking policy. Even though the cig machine remains, if you want to puff, you have to take it outside. Already, families are responding to the new rule. The Rookery has officially become a place downtown to take the kids to have a burger and not feel like you are feeding them in a bar. They have also gussied the place. Check out the low-light liquor bottle lanterns about each booth - Wes came up with the novel idea. And speaking of booths, his wife Betsy picked out some killer Damask-patterned upholstery to recover the seating, as well as added additional vintage lamps to the restaurant's signature rook nook upstairs. It's amazing what a big difference the little things make. But among the best of the changes is the menu. It's still bar apps, burgers, salads and such, but the classics are still there and the signatures are even better. And the guys are having some fun with it. All the burgers have a Georgia music twist -- The Big O Burger has an onion ring, the Johnny Jenkins burger comes with pimento cheese, the Allman Burger has mushrooms (what else?? ), the Dr. John has a fried egg . . . and the one Shuga tried, the Walden Greenback Burger, has a fried green tomato, bacon and if you ask, horseradish-infused bistro sauce. Yep, a burger in honor of the fam, who at one glorious time, was all about the bank. However, there is one thing on the new Rookery menu that has Mom as proud as peacock and as stuffed as a tick. When she was a little girl, growing up the shadows of downtown Macon where her dad had his office and living quarters, a treat for her was a trip to the Rookery where her dad would order her a scramble dog and watch with marvel at how his 50-pound (soaking wet) child would eat every sloppy bit. On Friday, Mom received two messages. 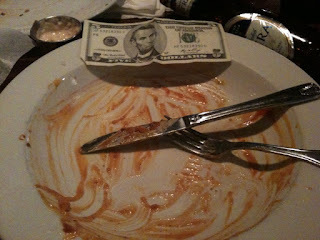 One was from Wes: "I bet you $5 you can't eat the Rookery's new Scramble Dog." 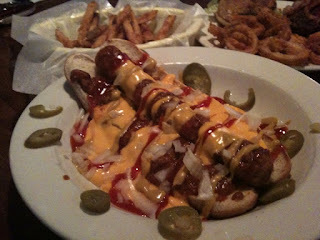 The next message was from Chad: "Have you tried the Rookery's new Scramble Dog? It's called The Jessica." Mom didn't believe it. So, she had to see for herself. Her text back to the both of them: "It's on." And it was. The 12-inch Vienna all-beef weenie is nestled in a toasted bun and smothered and covered with chili, nacho cheese, onion, ketchup and mustard. Jalepenos line the plate. And it is good. Damn good. So good, Mom pushed her battered fries aside, so she could eat every . . . last. . . bite. Then she mopped up her plate with the fries. And told Wes to pay up. The Rookery is rocking and rolling, y'all. And Candy's Land highly recommends The Jessica.